This starts by cupping the harp, which is when we use both hands to create an airtight chamber around the harp. It actually amplifies the sound and gives it a warmer tone. In terms of physics, we are harnessing waveforms and using them to our advantage. 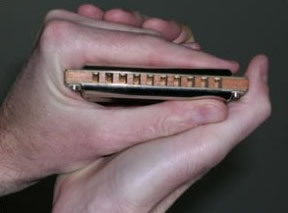 The image (left) illustrates the cupped hand hold for acoustic harp playing. By lifting one or more fingers on the left hand, opening the right hand alone, or throwing both hands open together, we can produce the well known ‘wah-wah’ effect. The vocal equivalent would be an alternation between a closed ‘mmm’ (or hum) and an open ‘aaah’. On the harp however, our hand movement adds an interim ‘www’ sound to the mix. Repeated slowly, the result is a ‘mwah-mwah’ sound. Accelerated, this becomes the straight ‘wah-wah’. Reducing this process to one rapid opening (or ‘throw’) of the hands and a symultaneous attack on the reed makes the harp ‘bark’. The wah-wah can be played acoustically without mic or amp. It can also be played semi-acoustically into a free standing vocal microphone. Best not to actually touch the mic however, and also to have a sound check beforehand to avoid any feedback. Once you progress to using a separate hand-held harp mic, you will find that only a semi wah-wah is attainable as your hands are already busy holding the harp and mic. A related effect is the hand vibrato – the ‘campfire’ sound. This is produced by rapidly fluttering the outermost hand as we play, normally with the fingers extended vertically, although you could also use a cupped, semi-cupped or open hand hold.